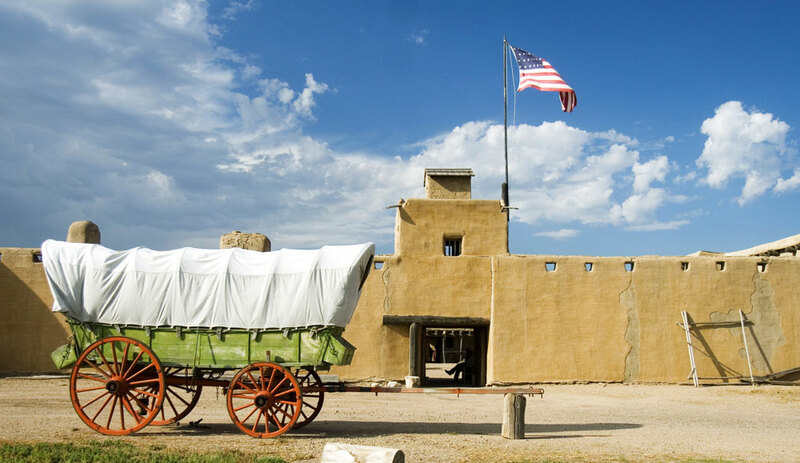 The past meets the future in the quiet, relaxed area at the Colorado portion of the Santa Fe Trail, where progress and preservation live side-by-side. Start near Lamar at the Great Plains Reservoirs, a collection of seven glassy lakes perfect for boating, fishing and waterskiing. Nature enthusiasts should bring binoculars — the reservoirs and surrounding prairie provide fantastic bird watching and have hosted almost every species ever documented in Colorado. On any given day, you can spot tern, piping plover, lesser sandhill cranes and maybe even a bald or golden eagle. Grab dinner in Lamar before exploring the town’s historic district. Check out the Madonna of the Trail Monument, an homage to the courageous pioneer women of the frontier days. If the timing’s right, catch a movie at the Lamar Theatre, a chrome-and-mirror art deco wonder built in the 1940s. Head west on the Santa Fe Trail Scenic and Historic Byway to Las Animas, where you’ll find the historic Boggsville Settlement. Built in the 1860s after the decline of the buffalo trade, Boggsville was one of the first areas in Colorado to begin livestock trading and included as many as 20 structures, including Kit Carson’s last home. Today, two of those structures have been restored and are open to the public. Continue on the trail to Bent’s Old Fort National Historic Site, a recreated buffalo-trading post. For years, it was the only permanent settlement on the trail between Missouri and the Mexican settlements. From Bent’s Fort, detour south to the Picketwire Canyonlands along the Purgatoire River in the Comanche National Grassland, where you can spend hours exploring ancient American Indian rock art, early Spanish settlements and the largest dinosaur-track site in North America. Hiking, biking and horseback riding are permitted, and you can also arrange for a guided auto tour. Other interesting stops in the grassland include Vogel, Picture and Carrizo canyons. All three canyons feature ancient rock art preserved on sandstone walls, and Vogel Canyon in particular is a favorite spot for picnickers. Later, continue to La Junta and take in some of the local culture at the Koshare Indian Museum, home to an astounding collection of American Indian art as well as a massive kiva that hosts world-famous Koshare Indian Dancers. Another local museum, the Otero Museum, is dedicated to documenting the day-to-day life of early La Junta. The museum’s historic building collection includes a turn-of-the-century grocery and a primitive log schoolhouse. Head northeast to the pastoral, tree-lined town of Rocky Ford, where cantaloupes and watermelons are famously delicious.